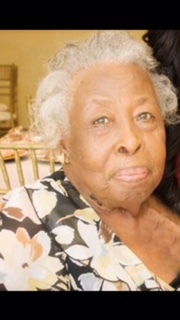 A homegoing celebration for Mrs. Fannie Mae Walker Barker Robinson of Tampa, Florida, who passed away on Monday, October 15, 2018 will be held Saturday, October 27th, 11:00 a.m. at New Friendship M.B. Church, 3201 E. Lake Ave., Rev. Dr. H.L. Daniels, Senior Pastor, officiating. The interment will be in Garden of Memories. On November 22, 1930 in Americus, Georgia the only child of Lucille Timmons Walker and Jessie Walker was welcomed into the world. Fannie spent her younger years in Lesley, GA enjoying her cousins, Eva Mae, Eltha Mae, Ruth Mae, Willie and Julia Mae (all deceased) a close knit of family and friends. In Lesley, GA is where she obtained her early education. Fannie moved to Tampa in 1940 with her mother and became a member of St. John Progressive M. B. Church, under the leadership of Rev. F.G. Hilton. She moved on Lake Avenue after marrying Roy Robinson and became a member of New Friendship M.B. Church with Rev. H.L. Daniels and remained a member until she made her transition. “A Time to Work”, Fannie worked for the State of Florida for 18 years and retired to become her very own boss by opening the Lake Avenue Nursery. This became her passion. She also become a real estate property owner in both Tampa and Jesup, GA. She leaves to cherish her memories: children, Deloris Rudolph (Carswell) Miami, FL, Gloria Adams, Deborah Jonesia, Michael Peterson, Sr. (Renee), Daryn Robinson (Angie), Jessie Dupins of Lloyd, FL, Mattie Severance of Miami, FL; grandchildren, Wanda Hood, Romone Rudolph (Lina), Victor Williams (deceased), Christopher Williams (deceased), Keshia Johnson (Jerry), Keith Barker (Tammie), Jerome Barker Jr. (deceased), Jeffrey Barker (Pilice) Jadd Barker (Edwina), Jerod Barker (Sandra), Veris Barker, Jammal Barker of Jesup, GA, Micheala Cargaus (Tim) of Jesup, GA, Felisca Walls (Larry), Kenneth Barker, Shanavia Smith (Randy), Yssa Jonesia, Eduardo Jonesia Jr., Ashley Jonesia, Michael Peterson Jr., Micheala Peterson (Malik), Mariah Peterson, Porshae Robinson-Hay (Joshua), Daryn Robinson Jr., Dearly (Bell) Robinson, Quandarnous Robinson, Trinity Robinson, Dery’on Robinson, Zionah Robinson, Deandre Robinson; great-grandchildren, 52; great-greatgrandchildren, 23; other relatives and special friends, Joe Castillo (Gloria), Lorenza Fowler and family, Kenny Robinson (Heidi) of St. Petersburgh, FL, Robert Jordan (Hazel), Martin Robinson, Catherine Fullins of New York, Mary Barker, Burnett Barker, Margaret Ann Barker and family, Eduardo Jonesia, Sr., Eddie Mae Rogers, Arthur Jordan, Tiffany Harris, Neil Virgo, John Arnold, Leona Harris, Urley Williams, Claretha Bowers, Johnny Denard, Rev. James Denard (Debra), Nancy Jordan Brown and family of Palm Beach, FL, Deloise Forbes of Enterprise, Alabama and family, Severance Family, Beasley Family, Sylvia Yvette Cook and family, Queen Miller and family, Bernice Gafrey, Carswell Sims and family, Benjamie Walker (Honey Do), Debra Conway and family, Diana Robinson McDowell (John), Rodrick Fuller (Pearl), Hazel Tucker, Connie Jones of Jesup, GA, Mary Ann Elder, Tony English and family, Diasy Gay and family, Jay McMillian and family, Chris White and family, Rubina Johnson, Vivian Williams and family, Mary Rider, Kent Williams and family, Diane Durant and family. The visitation will be held at Aikens Funeral Home on Friday, October 26th from 5:00 to 7:00 p.m. The family will receive friends from 6:00 to 7:00 p.m. The family and friends are asked to meet at the church on Saturday for the service.